Get a partner who understands your customer's digital journey. Our Consulting Partnership gives you the confidence to build a winning digital strategy. Unlock the power of the 8 Channels of Digital Marketing in one holistic strategy. Lead your Digital Transformation and win the intelligent revolution. Reach more customers through understanding your market position, finding growth opportunities and strengthening the core. 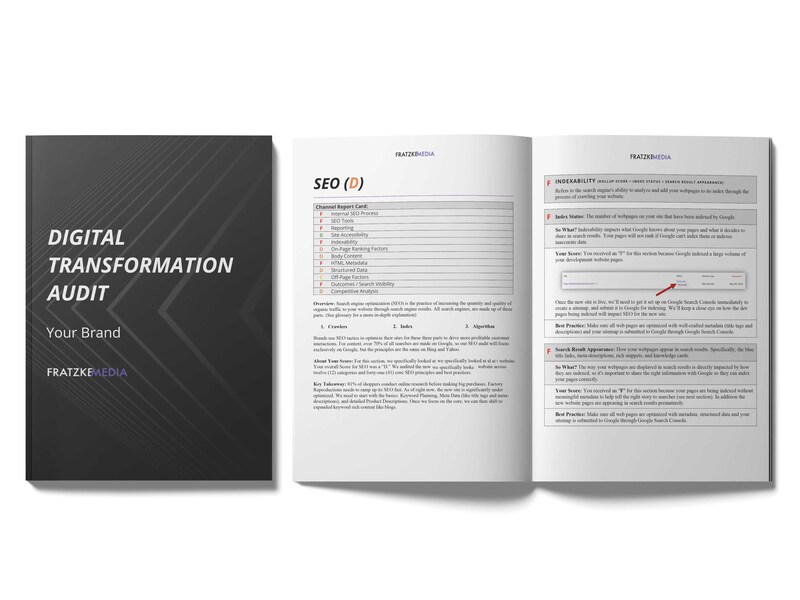 Identify high revenue activities and determine which digital channels are most likely to convert with our Digital Transformation Audit and Marketing Strategy Stack. Leverage our principle-based approach to digital marketing strategy. We measure our partnerships by results, not activity. Fratzke Media is easy to work with. Our experienced marketers can do the heavy lifting for you, so you can work on the business, not in the business. Fratzke Media continues to help our marketing team take a huge step forward in our digital transformation. They truly have been a strategic partner. Get the most out of your Digital Marketing efforts with features like our Digital Transformation Audit, monthly return on investment reports, Marketing Strategy Stack, and so much more. Easy to use and understand. Our Consulting Partnership features tools designed for seamless workflow and maximum Digital Marketing impact. Gain deeper insights into your online strategy across the 8 Channels of Digital Marketing. Make your job easier with an actionable path forward, project management and hands-on execution. Transform your Digital Marketing strategy with everything your team needs to win digital. 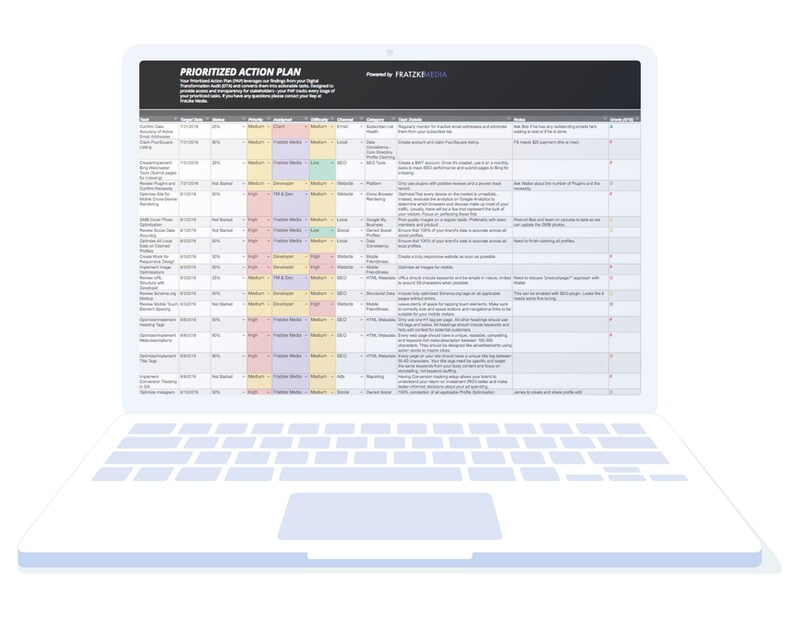 Understand and visualize your Key Performance Indicators all in one place across the 8 Channels of Digital Marketing. 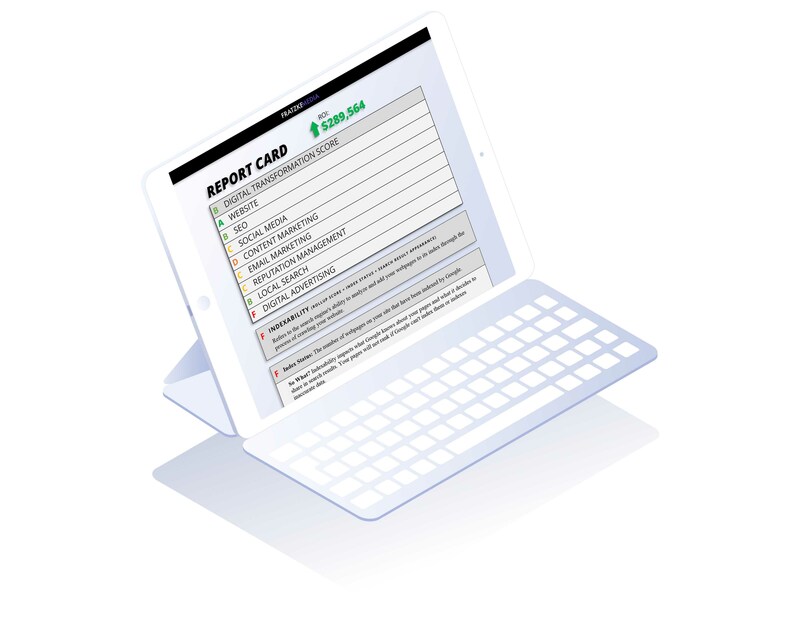 Gain comprehensive access to your return on investment - measured by results, not activity. Find a partnership that fits. Fratzke Media offers small business and enterprise Consulting Partnerships tailored to your needs. Get an On-Demand Marketing Department and understand the opportunities Digital Marketing can unlock for your business. Evaluate your digital strategies and compare them to best-in-class digital performers across your industry.